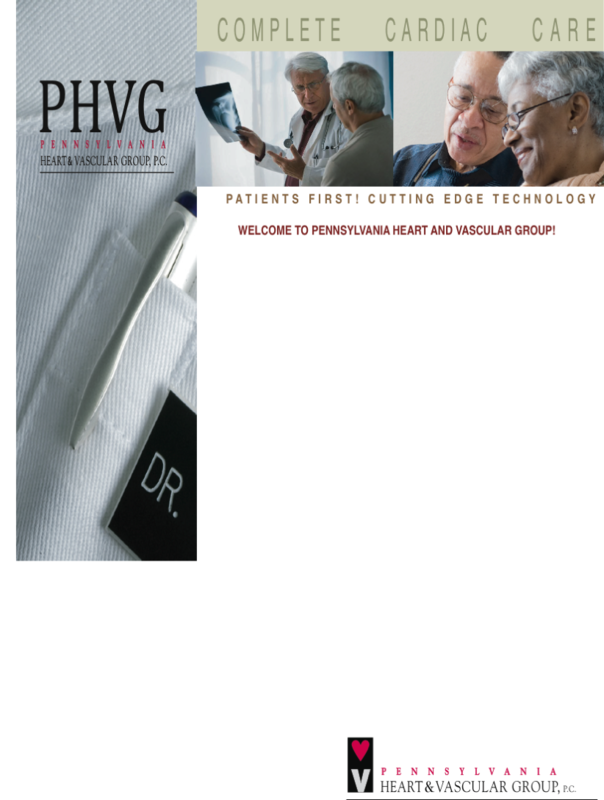 Welcome to Pennsylvania Heart and Vascular Group! We are the region’s premier source for high quality cardiovascular care. Our board certified physicians, advanced degree nurses, and skilled technicians are here to help you in the diagnosis and treatment of all types of heart and peripheral vascular system diseases. Expert training, state-of-the-art technology, and a tradition of compassionate care will make your visit with us a pleasurable and rewarding one. We have two offices in the northern greater Philadelphia region to serve you, each in close proximity to our affiliated hospitals. Your visit with us will include a detailed medical interview and a thorough physical examination. If needed, non-invasive diagnostic testing such as echocardiography, vascular ultrasound, rhythm monitoring, and nuclear stress testing can be done onsite in our offices. We perform more advanced testing such as cardiac catheterization, transesophageal echocardiography, and electrophysiology studies at our affiliated hospitals, which are among the finest and most respected in our area. Should intervention be required, our physicians are highly skilled in the latest catheter-based and minimally invasive therapeutic procedures such as percutaneous coronary intervention (PCI), peripheral angioplasty, catheter ablation, and bi-ventricular pacemaker/defibrillator insertion. In conjunction with our regular physician office visits, we maintain regular clinics in our offices for pacemaker and defibrillator monitoring and warfarin management. We strive to make your follow-up care with us as easy as possible, with flexible scheduling at our conveniently located offices. At all times, our friendly and knowledgeable staff is ready and eager to assist you. Give us a call!